WWE Elimination Chamber 2014 is out on DVD and Blu-Ray now, available from www.wwedvd.co.uk, priced £12.99 on DVD and £13.99 on Blu-Ray. Broadcast live on Pay-per-View from the Target Center in Minneapolis, Minnesota, USA on 23rd February 2014, the show is main evented by Randy Orton defending his WWE World Heavyweight Championship inside the Elimination Chamber against John Cena, Daniel Bryan, Sheamus, Christian and Cesaro, alongside The Shield taking on The Wyatt Family and Big E defending the Intercontinental Championship against Jack Swagger, as well as four other matches. The special features include one more bout, as well as three extra segments. 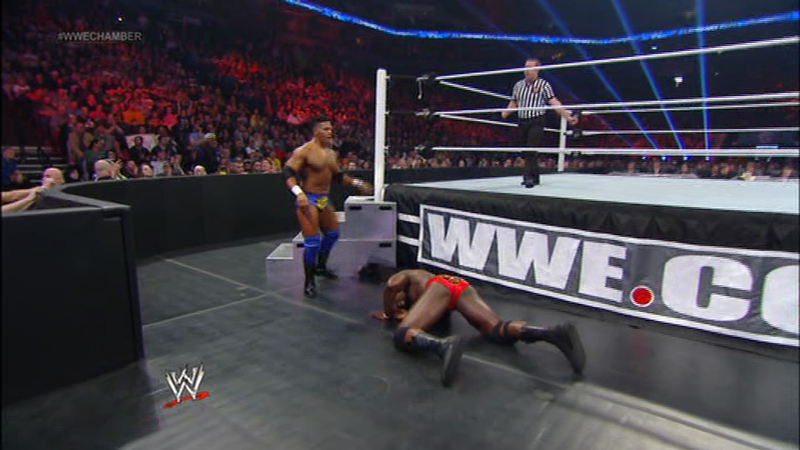 The commentary is provided by John Bradshaw Layfield, Michael Cole and Jerry Lawler. The main focus of WWE's 5th Elimination Chamber PPV (the last before the advent of the WWE Network) is, of course, the Elimination Chamber match, the 17th since the gimmicks induction in 2002 and this year for Randy Orton's WWE World Heavyweight Championship. John Cena, Sheamus, Daniel Bryan, Christian and the newly Christened Cesaro line up for a shot in what is an entertaining near 40 minutes of action. Sheamus and Cesaro's continued physical battle makes them the stand-outs of the bout, with Cesaro's numerous attempts at the famed Cesaro Swing. 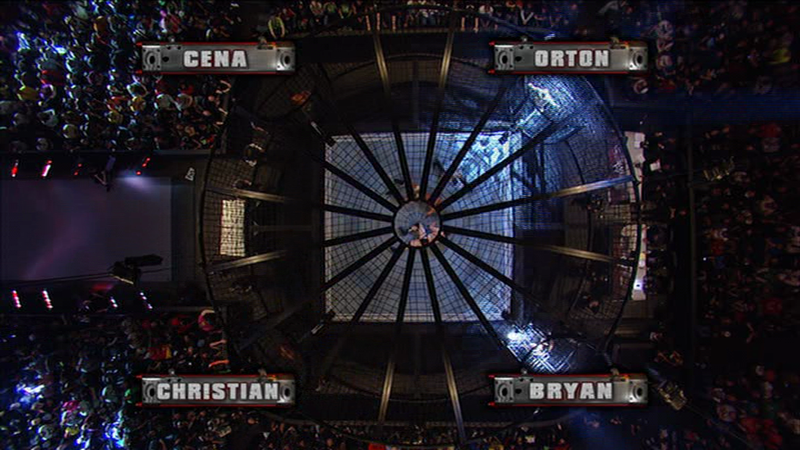 It's a much more story driven Chamber than the previous incarnations, with elements such as Bryan's injured shoulder, Christian's desperation and Orton's previous matches against his opponents all being referenced heavily. It is however let down by a contrived screwy finish, with way too much interference for a bout of this type. 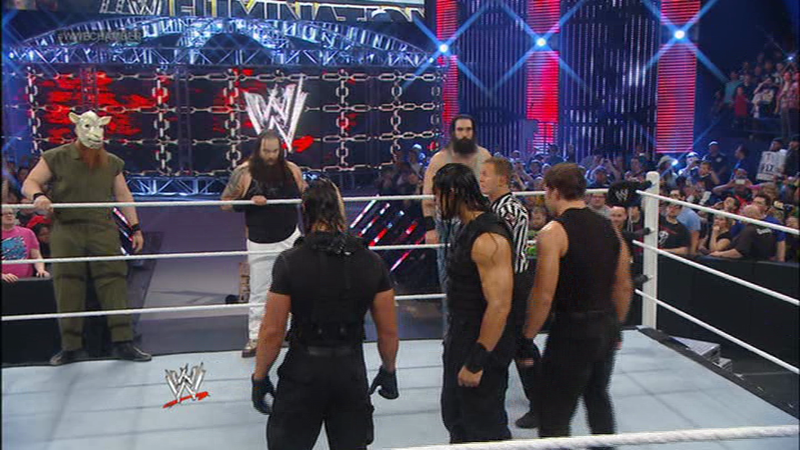 The much anticipated encounter between The Shield and The Wyatt Family is the stand out bout of the evening and even won our Match of the Month for February, beating stiff compitition from Sami Zayn and Cesaro's match from NXT ArRival. Plenty of well paced, exiting action, with all six men being used well, although on repeat viewing it does lose something of the buzz that it originally had. Jack Swagger's shot at Big E's Intercontinental Championship is a decent slice of heavyweight dealings, with some cool spots like Big E's spear through the ropes. It does however suffer from a messy final few minutes, with some less than sound psychology thrown into the mix. The New Age Outlaws tag title defence against The Usos is again passable, without ever looking to move past second gear. Batista and Alberto Del Rio's bout is more enjoyable than it really deserved to be, with Batista still looking ropey in singles matches. The Prime Time Players explode in a dull bout with little crowd interest, and with the knowledge that WWE did nothing with either man following the bout doesn't help it either. AJ Lee and Cameron's sub four minute match is set up for a match that didn't happen, AJ's promo is probably the best thing about it. Bad News Barrett makes numerous appearances throughout, to deliver promos, which are hit and miss, although Barrett must be commended for his ad-libs following his podium breaking! In terms of specials features, there's a solid tag team outing piting Goldust & Cody Rhodes against the fledging RybAxel team, which easily could have featured on the main card. Zeb Colter giving The Real Americans a pep-talk prior to their respective matches is also a nice addition, giving extra context that isn't referenced during the PPV, as does a Bray Wyatt promo dedicating The Wyatt Family's bout to Sister Abigail. Finally, a Randy Orton promo post-PPV reminds us that at one point WWE considered Orton vs. Batista a viable main event for WrestleMania. Overall, Elimination Chamber 2014 isn't a bad PPV at all, with The Shield and Wyatt Family bout being one of the best we've seen this year, whilst the Elimination Chamber bout is more than watchable also. It is however let down by the under card, which was poorly put together in terms of storylines, with little follow up coming out of the PPV either. I would've like at least one of the excellent matches that took part on WWE television in the build up (Cesaro vs. John Cena perhaps) to really make this set, although I guess that's what the Blu-Ray is for.